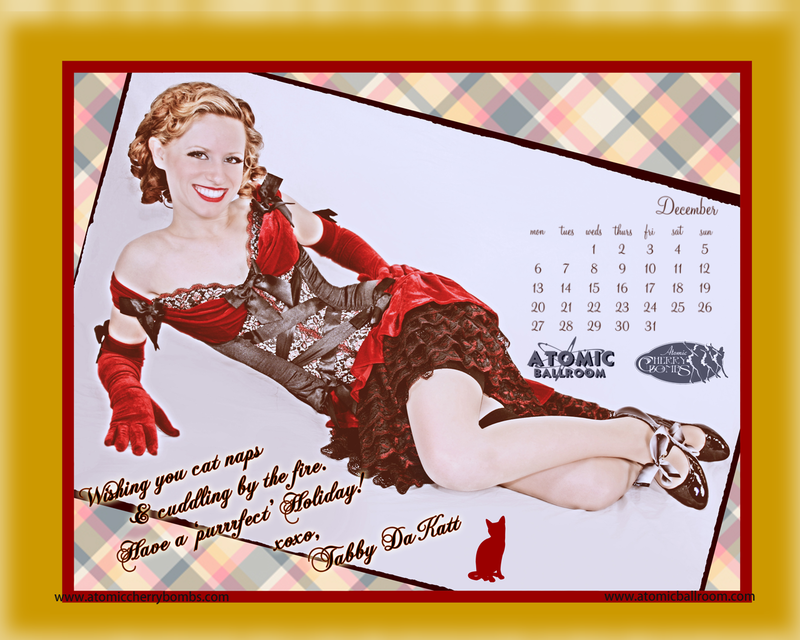 Ms. Tabby Da Katt is the December pin up girl with the most! Our December PinUp will make you all warm and fuzzy inside, perfect for those dreary, ice cold winters that Orange County, CA is famous for. In fact, it must be at most, 60F outside right now! Brrrrrr! From Hollywood to Harlem, Ms. Katt has been around the block more times on a big wheel than your average 12 year old. Her passion for vintage transportation is what makes this pin up even more special. From Big Wheels to Red Riders, she has ridden them all! Spotted around town dressed to the nines, Ms. Katt spends most of her evenings hanging out at the poshest of night clubs: The Kentucky Club, Sutra Lounge, The Mint, Smalls Paradise, The Hey Hay Club, and many more chic of the chic hot spots. *Yes, I did say The Mint, you didn’t know she likes karaoke? While on holiday in Havana, she met a policeman who happened to be in showbusiness as well. After a few mojitos, some plantains and Macitas de Puerco Fritas, they both flew back to Hollywood where she got her first movie roll. Below, you can view Ms. Tabby Da Katt dancing to her namesake song and performing the most provocative pin up moves that she is famous for.